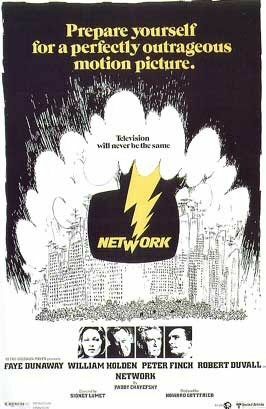 This dark satire about the sensationalism of news in the 70’s sees showbiz and soulless Faye Dunaway fight for ratings at a struggling network, UPS. Featuring Dunaway as cut throat Diana Christensen, William Holden as Max Schumacher the last good editor caught in the crossfire, Robert Duvall as the face of corporate greed and Peter Finch as Howard Beale. It centres on the exploitation of the mental breakdown of long-time news anchor Howard Beale who upon learning he is to be fired, threatens to kills himself live on air. Seeing a ratings lift, ruthless and aloof Dunaway plots to keep Beale on air, exploiting his breakdown and shaping him in to a modern day anti-establishment prophet. Taking aim at corporatisation and commercialisation of TV news Network is sharp, insightful and almost clairvoyant prediction of the future of TV news. In a way you can imagine seeing the early days of Fox news, with Beale not dissimilar to, well a number of their news anchors. Among the many accolades Network won four academy awards in 1976 and was selected for special preservation in the National Film Registry of the USA for its cultural and historical significance.